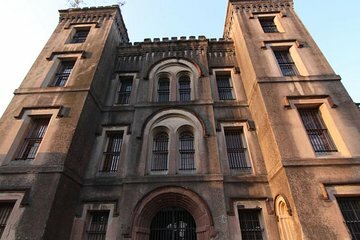 Discover the spookier side of Charleston’s history on this 45-minute haunted tour of the Old City Jail. With an expert guide, learn about some of Charleston’s most notorious criminals, pirates and despicable characters like Lavinia and John Fisher, 19th-century hoteliers who allegedly poisoned their guests. Visit eerie spaces such as prisoner cells, hallways and locations where criminals died. Brace yourself for a possible ghostly apparition! Loved hearing the history behind the jail. We went at night which I think was the best time. The tour guide was great..
Great attraction where you have the opportunity to learn about history. The tour guide was great! Definitely worth the money. Was quite fascinating - you head through a few rooms although all of them are mostly empty - just a few resurrected old cages where some of the inmates were held. One of the ladies within the group claimed to have something touching her head when we were in a dark room and it made it pretty exciting! Not so much for her though, she was a little freaked out but if you can handle being spooked a little this is a decent tour. I would say this is more of a historical tour but we really enjoyed it. For the it was worth it for our family! The jail ghost tour was a little disappointing. We didn't get to see the morgue or other parts of the building. Most of the windows were intentionally closed to make the visitors hot and justify cutting the tour short, so the operators could fit in more starting times. The jail has such a fascinating history, and the guides could do a lot more with it. As always, when it comes to ghosts, the almighty dollar still rules. Very dark, lots of stories and history. But I thought the walk there through dark alleys was scarier. Interesting history about the jail. Very sad. Awesome tour, Will was an interesting tour guide, totally enjoyed him! Though the jail is very hot in the summertime, the tour guides are knowledgeable and make the experience a lot of fun. Lasted maybe 20 minutes of actual inside time. Not much to see.